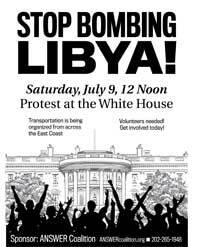 Saturday, July 9 at the White House: Stop the Bombing of Libya! Click here for details about upcoming events taking place June 22-26 in Chicago, Washington, D.C., New York City and Syracuse, N.Y. Buses and car caravans are coming from New York City, Boston, Philadelphia, Baltimore, New Haven and other cities and towns. Please make an urgently needed donation to help pay for transportation costs, posters and leaflets. Following the July 9 protest at the White House, we will be mobilizing for a mass action against the bombing of Libya taking place on Saturday, August 13 in Harlem. The demonstration is initiated by the December 12th Movement and has the support of a large number of organizations. More details are coming soon. Contrary to the absurd argument that the bombing of Libya does not constitute a “hostility,” this is fierce and illegal war aimed at carrying out regime change in the country that possesses the largest oil reserves in Africa and the ninth largest in the world. Hundreds of thousands of people demonstrated in Tripoli on June 17 against the U.S./NATO bombing and the terrible toll it has taken on the people, economy and infrastructure of Libya. Of course, you didn’t see any coverage of this huge demonstration in the corporate media. That massive outpouring of humanity undoubtedly included many people who have grievances against the current Libyan government. But the people of Tripoli, like people everywhere, stand together against bombing by foreign powers in pursuit of an imperial agenda. Libyans want peace and they must be free to determine their own destiny. The people of the United States are adding their voice of opposition on Saturday, July 9 at the White House. By a margin of 2-to-1, the American people oppose this illegal and criminal war. There is no such thing as a “humanitarian” cruise missile. The U.S. government is spending $10 million a day bombing Libya while it bombs Afghanistan and still occupies Iraq with 47,000 troops. On June 20, for instance, NATO and the Pentagon pummeled the birthday party of a four-year-old boy with heavy missiles. They killed 16 civilians, including the four-year-old and his mom, as well as other children and their parents. The four-year-old was the grandson of Khweldi el-Hamedi, an associate of Colonel Gaddafi who participated in the 1969 coup that overthrew the old monarchy. NATO is killing the civilian family members of the Libyan government in an attempt to break the will of those they have targeted for destruction and overthrow. The Pentagon used the same type of tactic in the 1991 Iraq war. At a time when the U.S. government says that it is broke and that tens of thousands of teachers and nurses and other workers are being fired because of the “budget crisis,” there seems to be limitless funds for war, bombing, invasion and occupation. Please join us Saturday, July 9 at the White House. 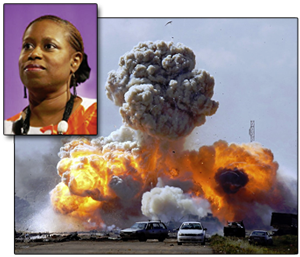 You still have the opportunity to hear Cynthia McKinney’s eyewitness report from Libya. Click here for details about upcoming events. If someone forwarded this email to you, click here to sign up to receive analysis and action alerts from the ANSWER Coalition.